Falling in love is never easy, but falling in love with an immortal god while your days on earth are numbered is almost more than a young girl can bear.Newbery Honor author Gail Carson Levine has created a stunning new world of flawed gods, unbreakable vows, and ancient omens in this spellbinding story of Kezi, a girl confronted with a terrible destiny. Attempting to thwart her fate, Kezi and her love, Olus -- the god of wind and loneliness -- embark on a series of dangerous and seemingly impossible quests. I read this as a teen and I remember it being stinkin cute! I think I read the ending nine million times and would have kept going if it hadn't been a library book. This was given to me as a birthday present a few years ago! 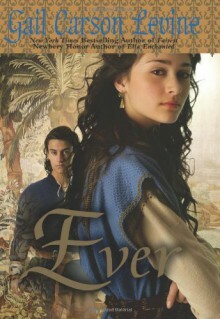 I figured that, since I love Ella Enchanted and The Two Princesses of Bamarre, I should probably read it. Even if I didn't like her other stories as much.